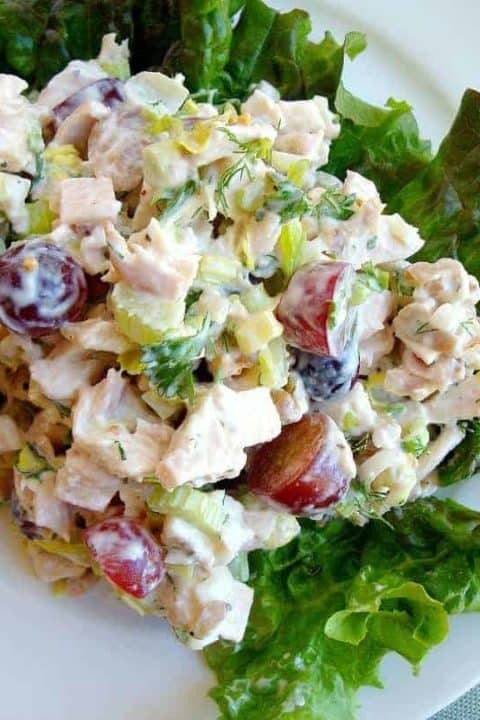 There are many, many chicken salad recipes out there with as much variety as people have varying tastes. This recipe is the classic with a fresh twist and if you like recipes with Flavor Mother-load, you will enjoy this juicy, crunchy, creamy, sweet and tangy salad. This really is the best chicken salad recipe I’ve ever made. And this beauty of a recipe is not only customizable to your liking, but I use ready-to-eat rotisserie chicken that you buy from the deli. So everything comes together in a snap. Chicken that is slow cooked and bone-in is more flavorful than using boneless chicken breasts any day. For this Chicken Salad Recipe, I’m using the ingredients you see here. Within the written recipe, I’ve listed some adaptable variations to suit every taste or whim. And finally, if you’re looking for a great menu or special meal, pair this with my Strawberry Soup recipe for a perfect combination that’s delicious and makes a beautiful presentation. This recipe is made with classic ingredients. 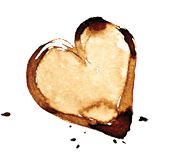 Also included is a list of easy and delicious ingredient substitutes for every occasion. Dice pieces of chicken from the rotisserie into bite-size cubes, making sure to use dark meat as well as the breast meat. If you have a good amount of chicken leftover after cutting the pieces for this recipe, save the remaining chicken and bones to stew into chicken soup, or to make chicken stock. Combine all other ingredients with the chicken in a large bowl and stir until well combined. Season with salt and pepper as needed. 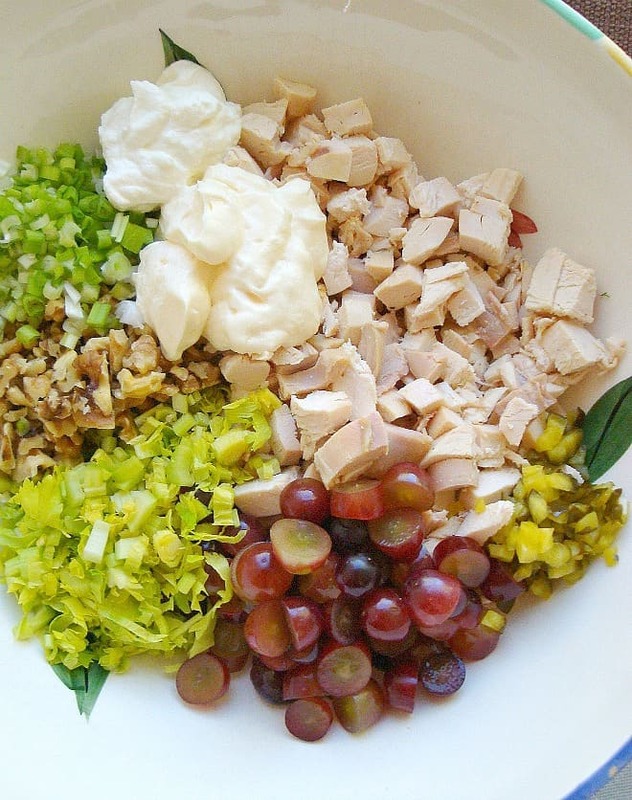 If you like your chicken salad wet, you can add more mayonnaise or even a little half and half. Refrigerate at least 30 minutes before serving, or make the day prior. The flavors are even better the next day. 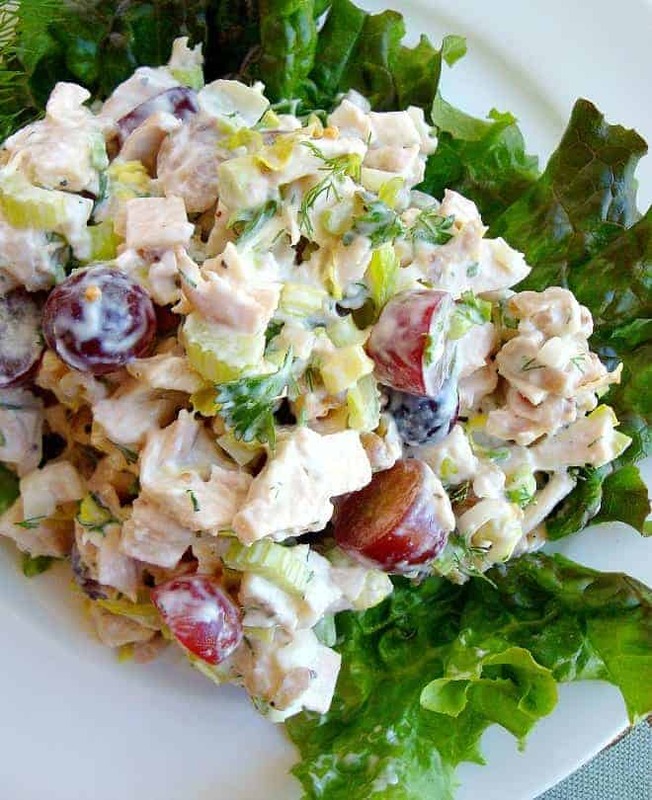 Chicken Waldorf Salad - Add 1 cup chopped medium cheddar cheese, one crisp red apple,of your choice and 1 cup raisins. Omit pickles and dill for this variation. Chicken Cashew Salad - Replace walnuts with cashews, add cilantro and omit pickles and dill and parsley. Chicken Tarragon Salad - Add 1/2 to 1 teaspoon tarragon, a good dash of oregano and use pecans in place of the walnuts, omitting the dill. Recipe source is Good Dinner Mom’s kitchen. I have looked everywhere for Bread and Butter pickles but can’t find them. You say 3 pickles so how many sliced pickles would that be? Also I’m preparing this for 20 people, I can figure out the rest of the ingredients but the pickles have me stumped! Hi Sherrill, First of all the recipe can be adjusted where it says how many it serves if you change it to 20 people it will change all the quantities for you. But the pickles is just three slices of bread and butter pickles so it’s a tiny amount that adds a nice zing and sweetness. I will edit the recipe to clarify that that is three slices. If you can find sweet pickle relish I would use 3 teaspoons as an equivalent for the 3 pickle slices. The pickles do make a difference in their recipe. Hope this helps. I plan on making this today, but I noticed that the recipe mentions grapes twice “1 to 2 cups red seedless grapes cut in half”, and “1 cup red grapes, sliced”, is that correct? Hi Carisa, I hope this reply isn’t too late but I use 2 cups. You can kind of eyeball it to your liking. I’ll go in and edit to correct the recipe. Our internet has been down all day so I wasn’t able to access. Absolutely delicious! I have gotten tons of compliments on this chicken salad. The rotisserie makes it taste best. Love it! Kathy, thanks so much! I’ve had friends taste this recipe and tell me they’ve “fired” their own recipe in favor of this one, lol. Glad you like it. 1/4 what dill and 1/3 what parsley? Teaspoon? Cup? Sorry about that Dee. I just went in an corrected the recipe. It is 1/4 cup dill and 1/3 cup parsley. Thanks for your email. Thank you for the correction! I can’t wait to try it! Simple easy receipe that even I can make! Amazing! Mel, I am so glad I could help. We love the basic version and the waldorf best. Sally, you read my mind because I need a go-to chicken salad recipe. Trying this one for sure! This look delicious! I think ill make it for lunch!